Jim is of Counsel for Government Relations to Merrimack, Potomac + Charles. 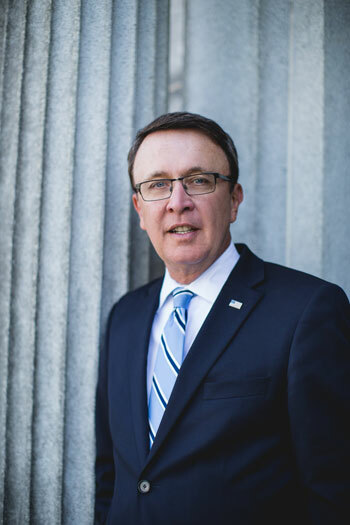 He is the founder of The Demers Group and also serves as President of Demers & Blaisdell Inc. James is a former member of the New Hampshire House of Representatives and former congressional candidate. He has over 35 years of experience in the legislative, regulatory and political fields. He has been a political commentator for CNN and MSNBC and he is a regular commentator on WMUR-TV, New Hampshire's ABC affiliate, New England Cable News, WBIN and other media outlets. He has served as New Hampshire co-chair of Barack Obama's presidential campaign and most recently as an advisor to Hillary Clinton's 2016 campaign. He presently serves on the advisory board of the New Hampshire Institute of Politics at St. Anselm College, he is the chairman of the State of New Hampshire International Trade Advisory Committee and he participates as a "political insider" for the National Journal. In February 2012 he was nominated by President Obama to serve on the Board of Directors of the Overseas Private Investment Corporation and he was confirmed by the U.S. Senate on January 1, 2013 to serve in that position. He has been recognized numerous times as one of New Hampshire's "most influential" and "most powerful" people by Business NH Magazine and Politicker NH. James is a graduate of the University of Miami and he holds an MBA from Southern New Hampshire University. He is a former three-term member of the New Hampshire House of Representatives where he served as the Assistant Minority Whip. He has served as President of The Demers Group for over 16 years. Additionally, from 1997 - 2007 he served as President and Executive Director of the New England-New York-New Jersey Financial Services Association and through 2010 he also served as Executive Director of the National Card Coalition, an organization consisting of major national credit card issuers and related companies with an interest in state legislative, executive, and regulatory activities affecting the credit card industry in all 50 states. He has served as Vice President of Government Affairs at Marine Midland Bank in New York, NY and Vice President of Government Affairs at the Associates Corporation of America in Dallas, TX.